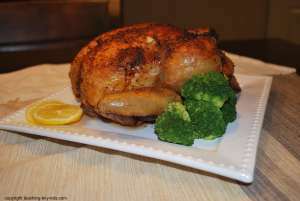 Healthy Recipes: A Whole Chicken Stuffed with Fresh Herbs, Lemon and Garlic. This is a weekly staple...leftovers are perfect for sandwiches or slicing up and topping a salad, or sometimes my girls like to eat cold chicken. Freeze remainders for evenings you are in a rush and don't have time to prepare a fresh dinner. Rinse chicken, remove package inside (neck, liver, etc) and pat dry with paper towel. Drizzle or spray a little olive oil on chicken and rub on outside of chicken. Sprinkle inside of cavity and outside of chicken with salt (or Lawry's Seasoned Salt), pepper, garlic salt to taste. Stuff cavity with mixture of onion, lemon, garlic slices, chopped rosemary and thyme. Roast in the preheated oven until chicken reaches 180 degrees F (83 degrees C) and is cooked through and juices run clear. Cooking time will vary a bit depending on the size of the bird. I love my digital thermometer. It is easy, accurate and worry free. The probe goes into the meat or chicken and the oven door can close safely on the wire it is attached to which plugs in to the monitor which I stick on my refrigerator. That way the alarm goes off when it hits the right temperature. I don't have to keep sticking in a thermometer to check the temperature. Line pan with foil for easier clean up. If you don't want the chicken to sit in the drippings while cooking, set a low rack in the pan and place chicken on top. For added flavor, crush the garlic cloves and rub some on the outside. Snip some fresh rosemary and sprinkle on the outside as well. Or grate some lemon zest on the outside of the chicken. Use extra chicken for other toddler recipes. You can use the chicken for chicken salad sandwiches, or puta few slices on top of salads. Freeze a couple portions for a night you don't have time to cook. Instead of olive oil you can put a couple pats of butter on the top while cooking for a nice flavorful, crispy outer skin. Of course you don't want your child handling chicken, but let them help gather the ingredients or help identify what is needed. I have my girls go with me to our little Herb Garden and find which is the rosemary and thyme. I let them snip a couple sprigs. Although this is not a toddler recipe, I write out the ingredients on a sheet of paper in a list and they help me gather the items and match it to the word. We line them up on the counter. If they are older toddlers, it is also a great time to introduce the importance of handling chicken safely and cleaning counters after! Instead of Rosemary and thyme, sprinkle paprika liberally over entire chicken including inside. Instead of Rosemary and tbyme, sprinkle lemon pepper seasoning liberally over entire chicken including inside. Please note that nutritional information is an estimate and that added ingredients and other variables may influence values.